I am happy to announce that my latest book, "Toys for Tatting" is finally ready for sale. You can read all the details on my "Books for Sale" page HERE. If you would like your book autographed or personalized, please let me know when you order. You can use the "note to seller" on the Paypal order, or send me an email. 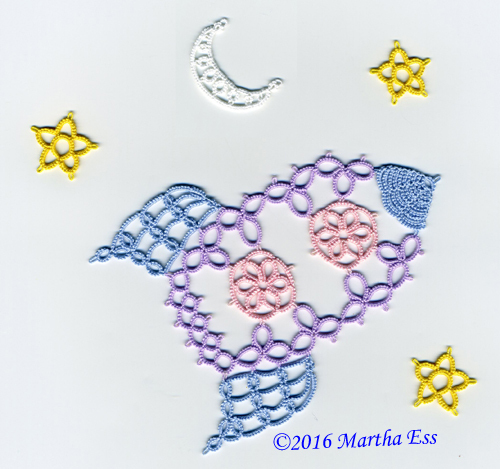 Thanks for your continued support for my tatting patterns. A special thank you for my test tatters, Jane Eborall, Erin Holloway Moseley, Karen Beary Parent, Phyllis Schmidt, Sherry Townsend, and Stephanie Wilson. When I wrote my previous blog post, I was so happy. My husband was going to be discharged from the hospital later that day. We had a diagnosis to explain why he had been feeling bad lately, and a treatment plan. He was going to get better and I was going to get to go to Palmetto. Well, after that, he was quickly back in the hospital, and he got better again, and then he rapidly got much worse. He passed away on September 5. There were some very bad days, but the last ones were peaceful with no more suffering. There has been such an outpouring of sympathy and love from those who knew. That has helped me keep going in these difficult days. I am reading my emails, but forgive me if I don't get to replying to them all. Bless you all. 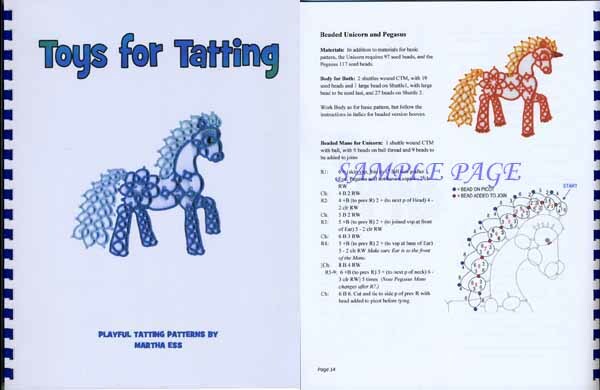 "Tatting is out of this World" is this year's Palmetto TatDays theme, and rocket ships have been popping up all over. Follow the link HERE and you will see Erin's clever rocket on a shuttle. Follow a link on that page to class projects, and you will see Richard's delightful little rocket complete with green alien. Then go over to Victat's blog for the most adorable little rocket yet. Up above is my own rocket, larger than the others, I think. It didn't win the contest for Palmetto logo (rightfully so after I saw Erin's), but it found a place in my up-coming pattern book, Toys for Tatting. Coming soon, watch this space! 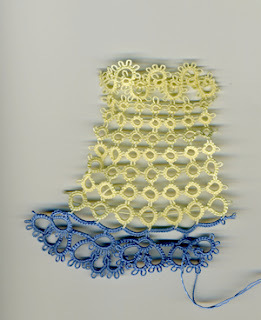 If you've been following Jane's blog, you know she has been making lots of variations on her Fandango pattern. Most recent was a little heart, excellent for a quick tat or emptying shuttles. The pattern is HERE. Since Jane so often uses lock stitch chains to such good effect, I thought this little pattern was calling out for some, and I gave it a try. They could use a little blocking to help with the symmetry, but over all, I am pleased. 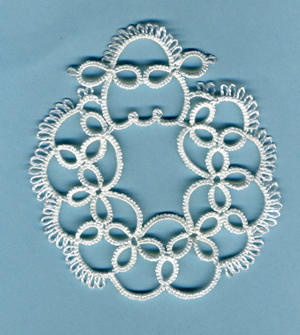 I used 10 lock stitches for the chains at the bottom and omitted the joins to the bottom ring. Also, I began with SR2, since I don't like trying to work in ends in a lock stitch chain. 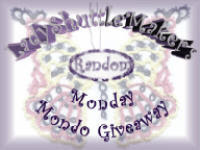 I think Jane is working up her own version of this idea, so keep an eye on her blog for further developments. Here's another of the toys in my upcoming book. I remember playing with these, do you? I've been busy. Busy trying to get a new pattern book finished in time for Palmetto TatDays, and right now things are looking good. My team of test tatters is hard at work. Do you remember this unicorn? I had it at Palmetto a couple of years ago and won an Honorable Mention at the state fair with it. It's going in the book! 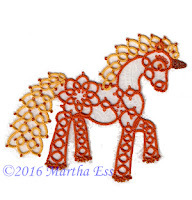 I turned it into a pegasus too, what fun. The book? It's all about tatted toys. I've been tatting a little and spinning a little, but nothing worth showing yet, in part because I've also been spending a lot of time out doors instead. Here is my personal plot in the neighborhood garden. 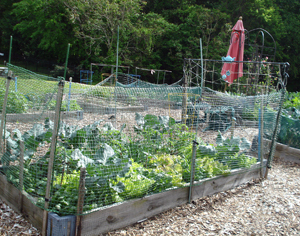 It's looking a bit over grown here since I had not picked the lettuce and spinach for some days when it was too rainy. So far, so good, with the plastic fencing to keep out the deer. I wish I were as good with growing flowers. When I plant flower seeds, I never know if I am planting them, or simply burying them, RIP. Palmetto Tat Days is the event I most look forward to every year. In the spring, the suspense grows, waiting first for the teacher list, and then to see the class projects. The pages are still under construction, but you can see the class projects HERE and the schedule HERE. There are some amazing projects here. Now the suspense waiting for registration to open. As a teacher, I'm busy most of the time, but I can pick a class for my free time. What will I choose? Above is the logo designed by Erin. Isn't it clever? Sometimes, when I should be doing something more productive or going to bed, I do a little online window shopping instead. Look at this bargain I found HERE on Amazon Canada. A fifteen page booklet for $1717.16 Canadian, or approximately $1373.46 US. Less than a thousand hundred US dollars per page! I boggle at the notion of 15 pages. How can one of the pages have only one side? Is this bending the dimensions of the space time continuum? Maybe that miracle is the reason for the price. Don't you dare say it's just that the front cover isn't numbered. What fun is that. And only a little over 6 dollars more to mail it to me. I'll have to start saving my pennies. OK, going to bed now. 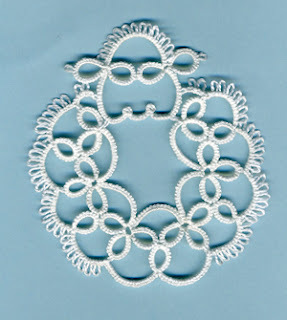 "Retro-tatting" is the humorous term for picking out stitches or untatting. When we find a mistake a ways back, there is the hard decision whether to pick out stiches all the way back, or just cut off the work. 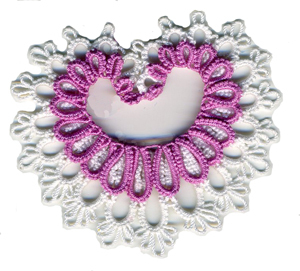 I am surprised I never hear anyone talk about the rapid method for retro-tatting. What you have to do is unwind the thread off the shuttle and pull the core thread out through the stitches. On a chain, you can get a grip on the core thread at the base of a ring, or under a picot. To pull out a ring, start out sort of how you open a closed ring. 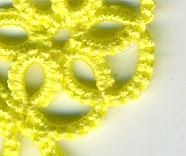 Put a crochet hook in a picot and pull on the core thread until there is enough you can pull on. 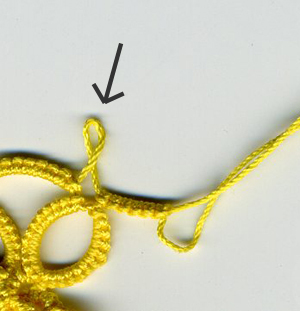 While pulling the core thread though the stitches, the thread end will twist and flail about, so be careful that it doesn't get knotted. OK, it's a bit tedious, and not real fast, but we're tatters, and slow and tedious is what we do. Sometimes it beats picking out stitches. Earlier this year I was suffering from "tatter's block." I had trouble finding any project I felt like doing, or that would hold my interest once begun. A little voice in my head said, "you'd rather be spinning." I held it at bay until I had managed to eke out enough patterns to apply to teach at Palmetto (yay! they accepted me), and then I got out the spindle. 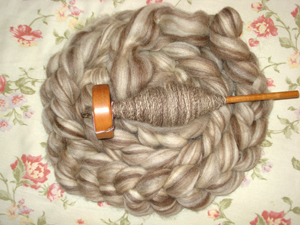 I had this batch of mixed BFL from the Spinnery in Gatlinburg that I was eager to try. The batches are quite similar, just differences in lighting. 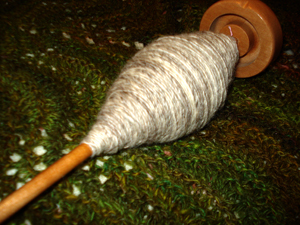 They will look good plied together. And then, as I am about halfway through, the voices in my head say, "It's time to tat! It's time to design. You CAN produce a book this year!" Dare I listen? It's a little later than usual to start in on a book to be ready by Palmetto-time. Can I pull it off? Should I try? The voices make my head spin. I did that thing you're not supposed to do when designing. I didn't write down what I was doing as I went along. I thought I would get back to it while I still remembered what I was doing... and I didn't. And I also tell myself I can always go back and count stitches, but I didn't take into account that I'm using very small, very pale thread. Oops. I hit on the solution to scan it and then blow up the picture real big. That helped... a little... maybe. Later: Hmmm...maybe next time, up the contrast with Photoshop too. 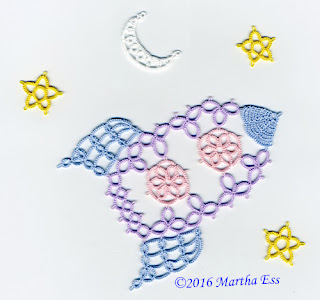 This week's project, or rather the beginning of one, is another pattern from "Occhi - Tatting - Frivolite Mustersammlung" by Susanne Rolf. This intricate looking edging is actually not that hard to memorize, so I can take it with me without pulling out the pattern to consult all the time. It tends to curl up while making, but isn't too hard to press flat. The thread is a discontinued Flora size 50, and the colors in real life are more pale, nice and subtle. This is intended to go on a hankie some day. 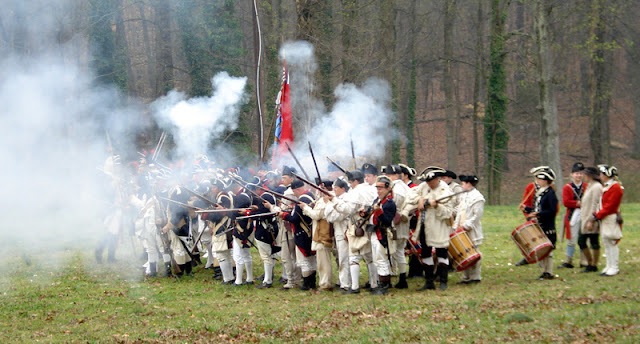 After the battle reenactment for the 235th anniversary of the Battle of Guilford Courthouse, we found ourselves walking beside a troop of Continental Regulars. One of them looked over at us, gave a big grin, and said, "We'll get 'em next time." 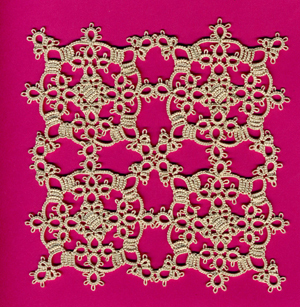 Trying to keep my hands busy, here are 4 squares, pattern by Susanne Rolf in her book, "Occhi - Tatting - Frivolite Mustersammlung." (She also publishes under the name Susanne Schwenke.) 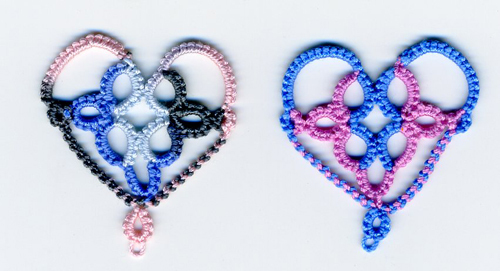 She designs very pretty patterns, many with some block tatting. In all her books, each pattern has a diagram, and is also written out in German. I worked from the diagram without trying to translate the text, and it worked out well. 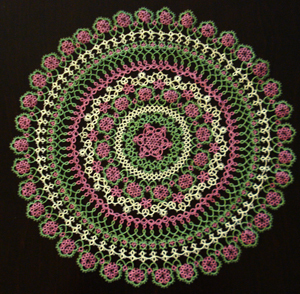 If you want to try to translate foreign patterns, Georgia has links to tatting terms in various languages HERE. Working in size 20, each individual square is about 2 1/2 inches across. I haven't blocked it, just lightly pressed. There's a tab at the top to click for her patterns. 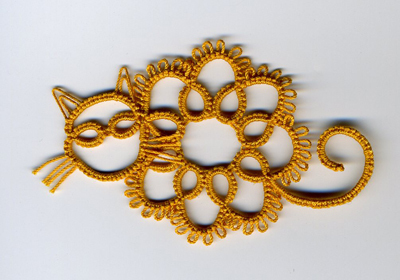 And there I found the pattern for this cat as well. Aren't they both adorable? Thank you, Dora, for sharing. By the way, instead of adding the tail at the end, I worked it as a floating chain so I wouldn't have another cut and tie. I made the sheep with white pearl cotton and the cat with Lizbeth color 611. Yeah, I fell off the face of the earth again. I had some real world issues, and some more real world issues, followed by some procrastination, followed by more procrastination when I realized I didn't have any recent projects to talk about. 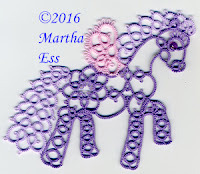 I decided to get back into the swing of things with the project from last week's Online Class, the Sweet Heart Valentine by Pop Lenuta Maria, with help from Karen Cabrera. You can see the pattern HERE. 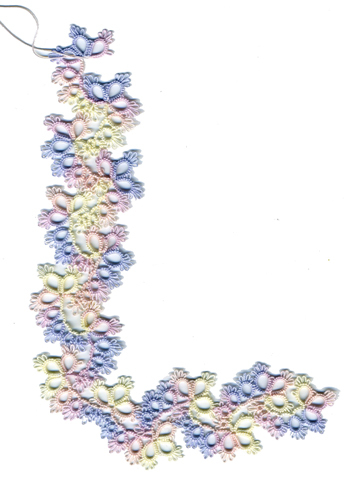 Muskaan made some beautiful 2 color versions and wrote about them HERE and HERE. I started off and quickly ran into trouble. My large rings on the backside layer wanted to twist and curl and the picots were getting too bunched up. This sort of thing happens sometimes when there is too much tension closing a very long ring. Usually, I can fix this by closing the ring part way and then loosening up the scrunched up part before finishing the close. This wasn't working very well for me this time, maybe because the 2 layer effect made it harder to get to the early part of the rings. Or maybe it was just me that day. Also, I was working with 2 colors, with a twist between rings, but I didn't like the way it gave color blips between rings. I cut that one off the shuttles and tried again. I asked Muskaan's advice since her hearts looked so nice, and she said she did not twist the colors between rings, so I quit that. I also tried adding a join between the large rings on the back side to see if that would make them lie flatter, and decreased the number of picots. Well, that was better. Muskaan had warned that some bare space between rings was recommended, but I must have not made my bare spaces big enough because my motif curled up quite a bit and required some stern blocking. So then I thought, working the pattern as orignially written, with all the rings made with the same shuttle might create the proper spacing. This was much easier to flatten. 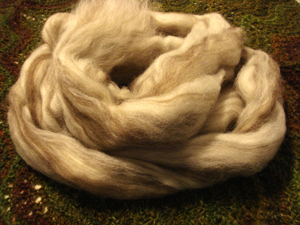 It curled up just a bit, but it was easy to mash down just a little and give it a quick press with the iron. 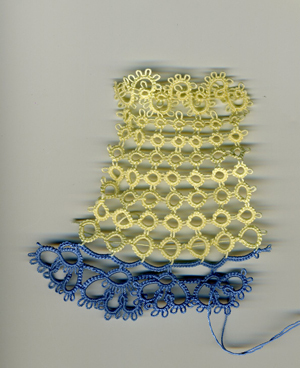 If I ever work this again, it might be a good experiment to make it with 2 colors, and work chains of a few ds between rings.